This week's doorway can be found at the Hatch Shell on the Esplande. The Hatch Shell is an outdoor bowl style stage on the banks of the Charles River and is probably best known for the annual Boston Pops July 4th concert. The polished granite base is fine for late afternoon reflections. 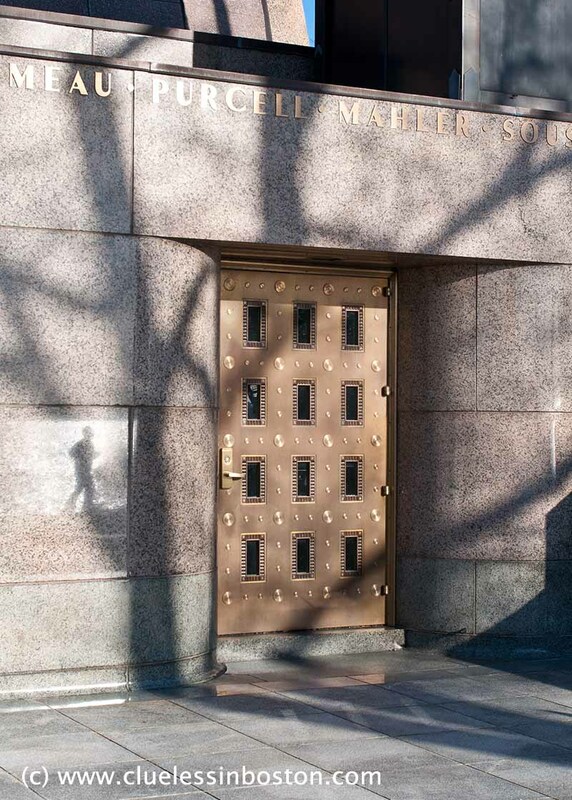 Beautiful doorway and reflections on the polished granite. My wife and I went to Boston for 4th of July weekend a couple of years ago and, of course, we had to go hear the Boston Pops at the bandshell before the fireworks. Wonderful shot. I like the shadows too. This golden door looks more like a bank door! :)I like the reflection on the wall! please pardon the question but, was the jogger shadow "added" to the photo? the jogger shadow makes this shot so intriguing. emarienan: No the runner's shadow was not added; just good timing. And actually, the reflection on the granite was larger in reality than what was captured by the camera. The reflection along with the door make really nice composition! You combine beautifully the Week's doorway and Reflections themes! The door rather mesmerizes me. I first I thought it was a bank vault. It's quite beautiful! This is perfect for Wednesday Doorway, and the runner's shadow is the icing. The shadow of the person jogging is a fantastic capture in this nice image! !